Tungsten is a hard, rare metal found naturally on Earth only in chemical compounds. It is atomic number 74 on the periodic table of elements, and it’s chemical symbol is W, in reference to its alternate name, “wolfram.” Tungsten derives primarily from wolframite and scheelite ores. It is known for its exceptional robustness and extremely high density, and has the highest melting point (3422°C) among all non-alloyed metals, and the second highest melting point of any element other than carbon. 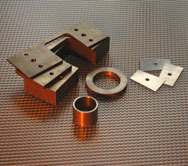 In the industrial sector, tungsten has a wide variety of uses, though it is most often used in a compound form, such as tungsten carbide, or in alloys. Tungsten carbide is one of the hardest carbides, and is used to make wear-resistant abrasives, knives, saw blades, milling and turning tools, and mining and construction equipment. Tungsten is also commonly used for armaments, as it is a common component in a number of heavy alloys used for cannon shells, grenades, missiles, and kinetic energy penetrators. It is also used as a powder in dense inert metal explosives to reduce collateral damage while increasing lethality within a small radius. As it retains its strength and other physical properties at high temperatures, and has a very high melting point, elemental tungsten is used in many high-tech applications. It is frequently used for light bulb, cathode-ray tube, and vacuum tube filaments, heating elements, and rocket engine nozzles. Tungsten and its alloys and compounds are also commonly used in jewelry. Sintered tungsten carbide is a popular and economical replacement for gold or platinum in wedding rings, as its hardness makes it highly extremely abrasion resistant. Tungsten carbide also holds a burnished finish much longer than rings made of other materials. However, tungsten carbide rings can be very brittle, and have been known to crack or shatter under a sharp blow. Marketech International, a leading worldwide supplier of advanced materials and refractory metals, provides tungsten and various tungsten alloys. They offer extensive experience working with all grades of tungsten and can deliver an economical solution for any company’s tungsten requirements.